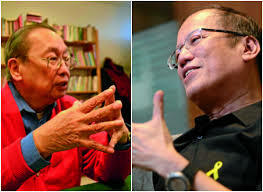 President Rodrigo Duterte’s threat to form a revolutionary government sounded familiar to two prominent individuals who had been up close to what a revolution meant — former President Benigno Aquino III whose mother was the country’s first revolutionary government leader and Jose Ma. Sison who founded a communist movement that continues to wage a countryside revolution. Aquino, whose mother the late democracy icon Cory initially ruled under a revolutionary government setup, said he was adopting a wait-and-see attitude toward Mr. Duterte’s threat. “Shall we say that we keep our ears open and our eyes also. We are very closely watching a lot of things,” the former president said at a press conference at his Times Street home after posting a P40,000 bail for a case stemming from the 2015 Mamasapano debacle. Sison, in a Facebook interview, said Mr. Duterte’s threat was actually a good idea but only if it meant the people taking power. Aquino said he could not comment further on an issue he has no personal knowledge of. Aquino had earned the ire of Mr. Duterte after commenting that the numbers showed there had been no stark improvement in the antidrug campaign despite the number of killings in Mr. Duterte’s war on drugs. Sison said he would support Mr. Duterte’s revolutionary government if it meant rebel forces determining government agenda. “In this framework, the three veterans of the Kabataang Makabayan — Duterte, Nur Misuari and me — could come together,” Sison said, referring to the underground youth organization formed by the Left. Under a propeople revolutionary government, Sison said Mr. Duterte would not have to worry anymore about loyalties because he would be supported by warm bodies, the people. In a taped interview aired on government television channel PTV 4 on Oct. 13, Mr. Duterte ranted about the possibility of declaring a revolutionary government to defeat forces trying to destabilize his administration. “If your destabilization is becoming worse and chaotic, I will not hesitate to declare a revolutionary government,” Mr. Duterte said in that interview. “I will arrest all of you and we can go to a full-scale war against the Reds,” the President said, adding his revolutionary government would be similar to that declared by Cory shortly after the downfall of the late dictator Marcos in 1986. But supporters of Mr. Duterte were not giving up. Rallies were set on Nov. 30 in Davao City, Cebu City, North Cotabato and Manila to press for a revolutionary government that would be federal in character. Opposition legislator Rep. Tom Villarin, of the partylist group Akbayan, said a revolutionary government would be like Mr. Duterte overthrowing himself and reinstalling himself in power.